Any producer can tell you that the right audio tracks can make the difference between a run of the mill production and an attention-getting, knock-out finished product. But, oh that quest for just the right piece of royalty-free stock music... There are volumes of great tracks out there requiring hours of listening and often trial and error import into the video. And with stock tracks coming in fixed lengths like 10 or 30 or 60 sec, well there you are trying to shoe-horn 12 sec 14 frames of video into the absolutely perfect 10 sec track that took three days to find. Sonic Desktop has the product line to simplify the process of finding, editing and scoring video with seemless integration of QuickTime, MPEG, or AVI formats. Actually, Sonicfire Pro represents the next generation of intelligent track creation building on the strengths of the company's original product SmartSound for Multimedia. An upgrade path is available for SmartSound users while SmartSound for Multimedia will continue to be offered at $199 for those who do not require the added features of Sonicfire Pro. Video editors, however, will unquestionably wish to upgrade their SmartSound or invest in the more expensive yet more robust Sonicfire Pro. 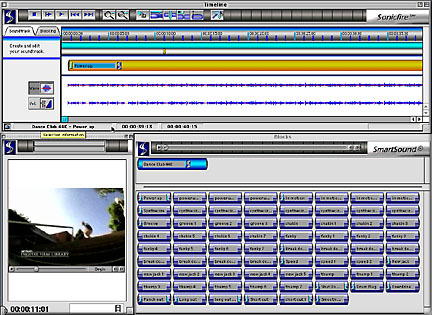 The uniqueness of the Sonic Desktop products lies in the way in which music is constructed. Rather than a scored track, the Sonic Desktop family of products is based around the concept of Audio Palettes. Currently over 30 volumes of fully orchestrated music, and several volumes of assorted sound effects, Sound Palettes, have been released. Each of the Audio Palette CDs contain a number of royalty free musical tracks all centered around a specific theme, e.g. Maximum Action, Narration Backdrops, Attention Grabbers, etc. These themes, in turn, are actually constructed of blocks of orchestration which the user can manipulate or which the program can automatically score to produce a number of possible arrangements. New Audio Palettes are released every 6 weeks or so and Sonic Desktop generally brings them out at a reduced introductory price. They also offer a subscription service with the ability to return for credit any volume you chose not to purchase. Sonic Fire Pro allows import of a reduced-size but full motion movie which then can be played and markers inserted at points where music is desired. Then, using one of several ways of bringing audio into the soundtrack, a musical track can be created conforming to exactly the length the editor desires. 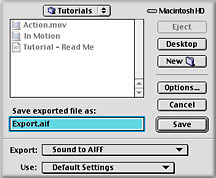 Then, export the audio track in any one of a variety of file formats (.aif, .wav, dv audio) and bring it into your favorite NLE application or export an entire QuickTime movie which incorporates the track. Since the underlying architecture here is QuickTime, the user can export that movie in any export format supported by QuickTime or whose CODEC has been installed on the userÕs system. The wide range of formats available assure cross platform Mac/PC utilization of files. Audio Palettes are available in two sampling rates- 22K 16 bit stereo and 44K 16 bit stereo. Those producing strictly for Web output could get by with 22K files. And while 22K files imported into a sequence in any NLE product would sample upward to the bit rate of the sequence, they certainly would not have the depth of 44K files. So, those producing for tape output are definitely advised to stay with 44K palettes. If you are exporting 44.1K audio and import those files into a 4K sequence, note that the underlying QuickTime architecture will automatically resample the audio to 48K. There will be no loss of quality or audio popping unlike what might occur if QuickTime must resample 32K audio to 4K. 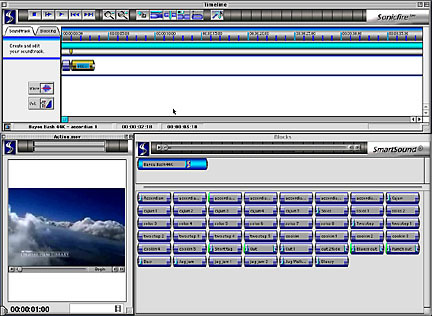 Launching Sonic Fire Pro gives a series of windows which include a Timeline for the track, Video and Blocks, where blocks of music will ultimately reside. At this point, there are several ways to score a video. The easiest way is to let Sonic Fire Pro's Maestro guide you through its wizard. The wizard facilitates finding exactly the right style of music, length and alternative arrangements all based upon the audio palette libraries which you have purchased and installed on your system. The Maestro is also available to Adobe Premiere 6 users as a plug-in by choosing New -> SmartSound under the file menu. Maestro will then operate in the same manner as the stand-alone application, returning the completed track to Premiere. The first step in scoring a video using Maestro is to import the video either by dragging the file into the Video window or choosing File -> Choose Video or shortcut Command-Y. Note that the clip can be played in the Video window with its timecode displayed. Now, bring up the Maestro by invoking Timeline -> Maestro or simply Command-M. Note that the Maestro allows a variety of selection criteria ranging from style of music to the ability to select by specific audio palette libraries, cut titles, etc. In this example, we want some Techno/Dance to accompany our video, and, in case we didn't know what kind of mood techno suggests, the wizard tells us. 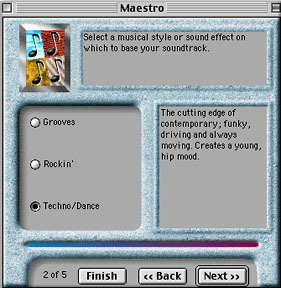 The next Maestro screen lets us select from, in this case, three categories of techno music. 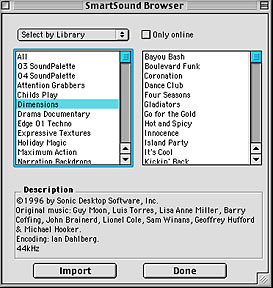 The selections displayed are based upon whatever SmartSound Audio Palettes have been purchased and installed on the computer. 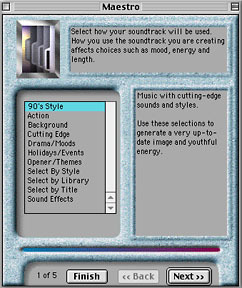 The Web option launches your default browser (provided, of course, the computer is connected to an internet connection) and goes to the SmartSound site where the page displays titles of cuts and the CD volume on which they are found. Clicking on the library link takes you to samples of those tracks, which can then be played on the web. 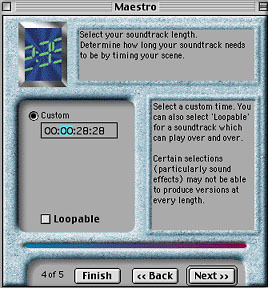 The next screen allows you to select the soundtrack length. In this case, the clip is 28 sec 28 frames and the clip length becomes the default. The length, however, can be altered to produce any length clip you desire. By virtue of their composition, some clips might also be loopable. 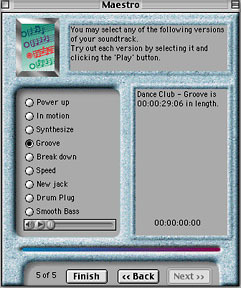 The computer now asks for the CD "Dimensions" in order to pull the appropriate track. Once the CD loads, Maestro presents several possible arrangements with both descriptive text as well as audio preview capabilities. Clicking the Finish button in the Maestro places an intelligently-created audio clip in the timeline as well as the individual blocks of music that constitute the Dance Club 44K cut which the Maestro has helped us select. Note that in this case I have chosen to display a wave form and the entire track. The option also exists to display the blocks which Sonic Fire Pro utilized to create this track. The project can then be saved for later use and/or exported in any supported format. Note the familiar QuickTime player export box. Here we have an example of an application harnessing the power of QuickTime. In this case, I am choosing to export only the audio track to be brought into my NLE later. I could also have exported a complete QuickTime movie using whatever compression method my system would support. That's the simple way. Now for just a quick introduction to some of the other ways of scoring a piece. Note that the QuickTracks version bundled with Adobe Premiere 6 as well as other SmartSound bundles only allow scoring via the Maestro. The techniques I will next highlight require purchasing the full version. If I decided I only wanted 18 seconds of music, I could grab a handle of that clip and shorten it to 18 sec. Sonic Fire Pro would then rearrange the piece as a complete clip of music at my desired length. If I wanted my music to start at 0 sec 16 frames and end at 10 sec 15 frames, I would just need to set markers at those respective points and Sonic Fire Pro could set my score within those boundaries. The program also allows mix and match of different songs from different libraries at varying points within the video. Or, to score from scratch, I could open any piece that I have in any library via Window -> SmartSound Browser and import that piece into the Blocks window. 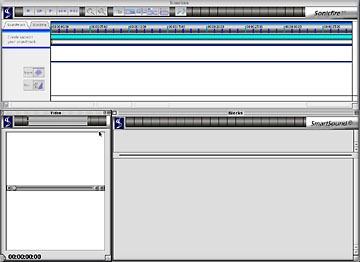 Tracks can then be constructed by setting a duration and allowing Sonic Fire Pro to create a track of that length or just by dragging blocks into the Timeline. After dragging a block, note that some of the blocks have green left borders. This indicates that the particular block will match what is currently the last block in the timeline. And remember, all of this music is royalty free and there for your productions. Finally, Sonic Fire Pro allows you import your own audio from any CD.Using the "chop block" feature, you can divide your own music into blocks for looping, re-arranging, etc. Unlike SmartSound pallets, though, these are not "smart blocks". Still, this feature provides wonderful versatility with other music. It is simply amazing. Yes, it is that easy to use Sonic Fire Pro. The distribution CD contains a tutorial as well as a complete manual in pdf format. The documentation is well-written and includes ample visuals. From the computer side of things, installation is simple. Installation of additional libraries requires merely adding those libraries via the Librarian command or merely double-clicking a file on the audio palette library CD. The 44K files require an unlocking code supplied with the CD. If you have relatively few libraries you own or plan to use, it is possible to avoid the switching and insertion of CDs by copying the audio files to your hard disk. This is obviously impractical for large numbers of files due to the storage space that would be eaten up by these large files. But, with a live internet connection, the web preview function does allow the preview of a specific file without fumbling with CDs. The company recommends providing dedicated storage for those users who purchase several libraries (over 5 tends to be their rule of thumb) to avoid switching of CDs. The documentation notes that each 44K palette requires about 400 mg of disk space and half that amount for 22K pallets. The program is also rock solid and in several days of extensive use, it has not crashed. Functions are implemented and labeled clearly. The company's web site has not only previews of the various audio tracks available, but also a QuickTime movie highlighting the uses and functionalieis of the product. Who needs Sonic Fire Pro? Any editor who uses music tracks and requires an extensive library of anything from classics to techno would be well served by Sonic Fire Pro. This is now already a second-generation product based on the award-winning SmartSound. Sonic Fire Pro saves countless hours of research, allows a wide range of scoring options, is easy to use and, dare I say, actually fun. The results are accurate and sound truly professional. Importing of outside music with even limited time-manipulation abilities represents a remarkable advance in scoring videos. When comparing Sonic Fire Pro to the cost of other stock libraries, the price comparisons are definitely favorable and the ability to customize music definitely tips the balance to Sonic Fire Pro over simple stock collections. The only negative point which I could possibly conjure up is also a positive- the sheer volume of libraries available require CD juggling or massive amounts of hard drive space for on-line storage. Personally, I'd gladly wrestle with CDs in order to produce the kind of tracks that Sonic Fire Pro can generate. Or buy a larger hard drive with all the added income that I will generate by enhancing my productions with Sonic Fire Pro tracks! It's a winner. It can make your productions winners.